An Islamic State (IS) fighter with strong family links to Australia has been sentenced to death by an Iraqi court after making detailed admissions about the operations and plots of the extremist group. 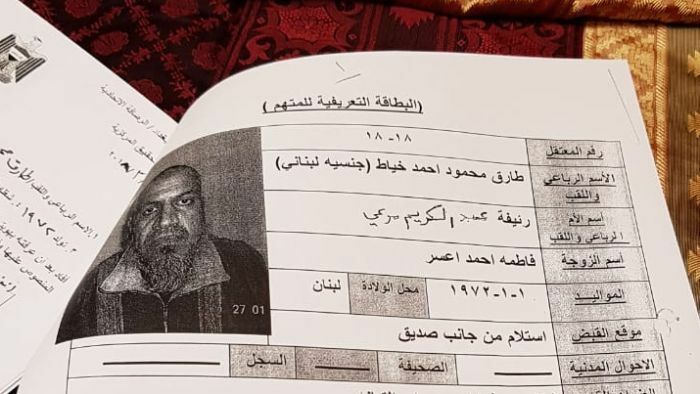 The ABC has obtained the Iraq court records for Tarek Khayat, a 46-year-old builder from Tripoli in northern Lebanon, who says he was appointed as an accountant for an IS battalion based in Raqqa. The records reveal Khayat was captured by United States and Iraqi forces on the Iraq-Syria border on December 27, 2017, five months after he had been severely wounded during airstrikes on Raqqa. He was so badly wounded that his leg was amputated in the local hospital. Khayat gave evidence to the court about his contact with alleged extremists in Australia. For legal reasons the ABC cannot publish these details. He also told the court about terror plots involving handmade explosives, poison gas and “soundless weapons” and provided information about IS fighters he met from France, Algeria, Pakistan, Lebanon and Egypt. Among the IS members he names are a Lebanese engineer who is an explosives expert and an aviation engineer. Khayat allegedly told the court he was trained as a fighter but was appointed to a more senior role — as the accountant for an IS battalion in the Syrian city of Raqqa. He said he earned a wage of US$40 per month but said he was in charge of distributing payments totalling $13,000 to members of his battalion. Khayat gave details of his commanders and IS comrades and the information in the Iraq files was used to sentence him to death last month. Convicted IS fighters can be executed as soon as 30 days after they are sentenced. The court file is allegedly based on direct testimony given by Khayat but the rules of evidence in Iraq courts are very different from Australia and there is no way of verifying Khayat’s testimony, or knowing whether any of his evidence was obtained through torture or inducements. Khayat said he had been an “Islamist” since 1989 and read the works of the conservative theologian Muhammad ibn Abd-al-Wahhab. He said he was a contractor who built homes for members of IS and also supported local Sunni militias fighting Christians. He said he left for Syria after IS declared its caliphate in 2014. He was sent to a military camp and trained to use machine guns and an RPG launcher. He pledged allegiance to IS leader Abu Bakr el Baghdadi and was enrolled in a military unit in Raqqa, where he was appointed battalion accountant. Khayat told the court he gave lessons about sharia (religious law) to soldiers based in Raqqa. In mid-2017, Kurdish forces began their four-month campaign to retake Raqqa. Khayat said in August 2017 he was severely injured during airstrikes on Raqqa. He said his leg was amputated in Raqqa hospital. The court file states Khayat was captured by US and Iraqi forces in December.